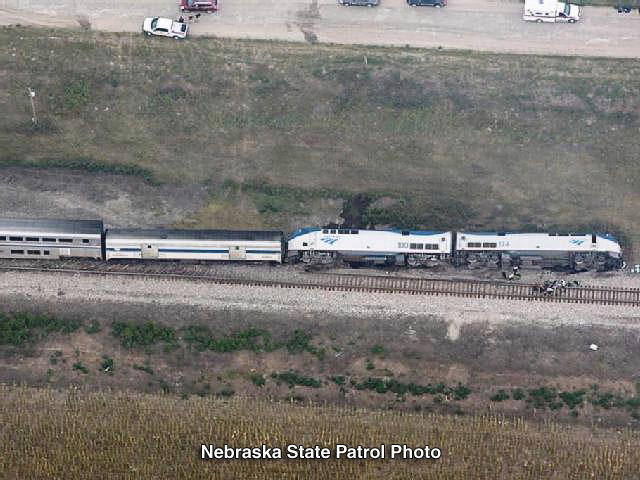 With all the discordant news that bombards us daily, reading about the overwhelming community response to the recent derailment of the California Zephyr in Nebraska, how wonderful to realize there is still a heart in America. I'm from the Boston area and was a passenger on the train along with my wife and 2 year old daughter. The rapid and effective response coupled with hospitality unlike anything that I've felt before drove me to write a letter to President Obama with the Governor of NE cc'd. I've never written a letter to a public official before. "I’m now on a bus to Lincoln, NE, gazing out into the cornfields that I have usually and unwittingly labeled as boring and uneventful. I have a new and profound appreciation for these fields and find myself searching for the homes and barns scattered across the landscape as I now understand that the people inside are what make up America’s great heartland. It’s interesting how powerful experiences such as these shape our lives. I was quite stressed yesterday morning not knowing how my daughter would cope with such an experience, how my family and I would get to Chicago or where we would stay for the night; yet less than 12 hours later I’m grateful for the experience as me and my family have new friends, more reasons to be thankful and many more memories to cherish than to forget as a result of the experience. And most importantly, we have an understanding of what the “heartland” is all about thanks to the people of Dundy County, Nebraska and surrounding areas whom came together, exemplified what is good in this nation and touched our hearts in such a profound way. I’m proud to be an American today." Your words have absolutely touched my heart. As I read them to myself I began to cry, not in sadness, but in pride of our wonderful town of Benkelman. I was at the High School volunteering and I had the privileged to meet many of the passengers and train staff. Just as you have described what an impact we made on you, please know that each of you have eternally made an impact on all of us. To the anonymous writer, Thank You! I am one of the responders who was on scene, and later at the high school in the command center. We live in a area where 90% of our calls, are taking one of our cherished elderly citizens from the nursing home to the hospital. We just never have things of this magnitude happen here. Well that is until yesterday. When the call came in my stress level jumped. As I got to the ambulance barn I told myself that I had to calm down or I would be no good to anyone. In route I talked with my wife trying to calm her fears. (She is a fellow EMT) that I am proud to call my wife. Talking with her trying to calm her was just as effective on me as her. I was scared, not so much by the wreck itself as the fear there was going to be people that I could not help. When we arrived on scene and found that it was not as bad as I had prepared for, it was just like any other call, find people in need and get them stable and to the hospital. As we got to the school and talking with passengers, I can truly tell you my life has been touched. Everyone involved in some way touched a life that day. As responders we touched a life in some way and from passengers and crew my life was touched 192 times! I am proud to be a part of this experience, and if I never make another run all the classes and sleepless nights will have been worth every second. Thank you Anonymous for recognizing our actions, but also thank you and the others for touching our lives as well. I was one of the first emergency responders on scene, and I can honestly say, initially the sight of over a hundred passengers and potential victims were overwhelming. The Amtrak crew should be highly commended as well! Their first thoughts were of the passengers, many of them ignoring their own injuries till later. 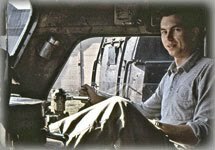 There was a fire fighter from California, a passenger, by the name of Joe, who offered assistance and was a great help...one of many unsung heroes that day...I wish I had got more information from him....but that wasn't a consideration at the time. At one point, later in the morning, I looked up the road, and was shocked to see emergency vehicles lined up for a mile....coming from McCook, Indianola, Imperial, Wauneta, Stratton, Culbertson, Palisade, Cheyenne County, Ks, Wray, Co., and I'm sure others that I can't name now. The assistance and willingness to help, and just compassion is why I moved here years ago. My pride in our little community of Dundy County has never been so strong. From the Benkelman EMS and Fire Dept., to all of our neighboring cities and the businesses that contributed to help care for the passengers. Not one person complained; all were proud to have joined in. I am honored to be part of this community. Rick Starks, Crew Chief, Haigler Ambulance. 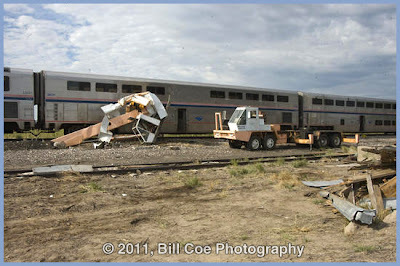 California Zephyr: Two Related Events? Two seemingly unrelated news items crossed my desk concerning Amtrak. 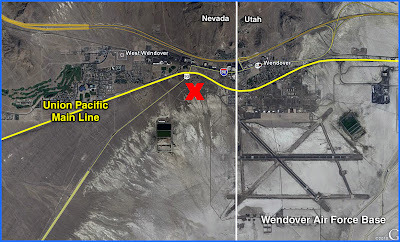 The first event: At 1:45 a.m. Thursday, police dispatchers were notified that a stalled car was straddling the Union Pacific railroad tracks near Highway 93A, near West Wendover, Nevada right on the Nevada-Utah State line. Dispatchers were attempting to inform railroad officials of the obstructed tracks when an eastbound Amtrak train hit the car and pushed it for about a quarter of a mile. The car was a total loss. The train had only minor damage. 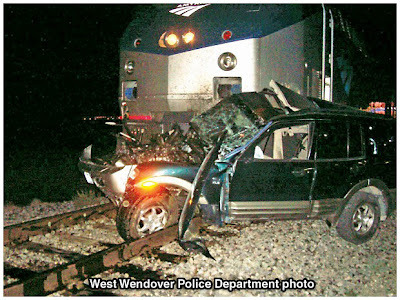 After a delay of about two hours - while the car was removed from the tracks and police inspected the scene - the train was allowed to continue on its way eastward. No personnel or passengers in the train were reported injured. Those in my audience with "whiskers" may recall that Wendover Air Force Base served as the training facility for B-29 air crews planning the atomic bomb attacks on Japan. At one time, more than 400 FBI (Federal Bureau of Investigation) agents, worked to help secure the secret mission of the base in 1944 - 1945, code named "Silverplate." In more recent times, Wendover was used in the shooting of "ConAir." See the hyperlink in previous paragraph. 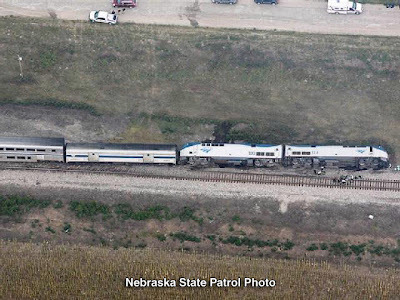 Hours later, a second event caught my attention: "An Amtrak train carrying more than 175 passengers from California to Chicago derailed today (Friday) after striking equipment on the tracks near Benkelman in southwest Nebraska. A small number of people were taken to hospitals." 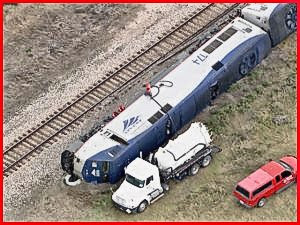 Passenger Harvey Evans, 37, of Grand Island, Nebraska, said it appeared that the train struck a crane that was doing demolition on a nearby grain silo. The truck-mounted crane was obviously fouling the BNSF main line! So what do these seemingly unrelated events have in common? Turns out they were inflicted upon the same train! Eastbound Amtrak Train #6, The California Zephyr, attempting to complete her journey from Emeryville California to Chicago Illinois! "All of a sudden I hear brakes. (The) train's rolling, rocking, moving side to side," said Evans, who grabbed a chair to steady himself. "All of a sudden we stopped." It's "been a long, rough trip," said Evans, in part because the train was running about eight hours behind schedule after hitting an abandoned car on the tracks Wednesday night near West Wendover, Nevada! "It's been one thing after another!" And so, Amtrak's California Zephyr finds herself in the news again. In this incident, the train struck a crane that was razing an old grain elevator adjacent to the tracks in an unincorporated area west of Benkelman, Nebraska. 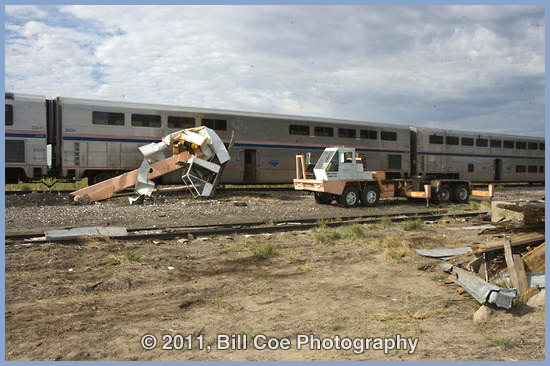 Two locomotives tipped on their sides and three of the California Zephyr's 10 passenger cars left the tracks about 8 a.m., near the state's borders with Kansas and Colorado. 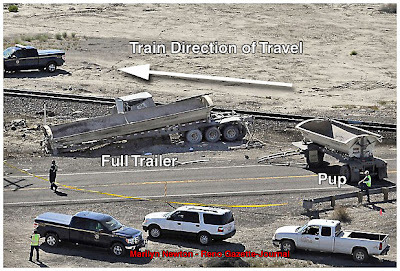 As shown the vehicle base and crane machinery were separated by the impact, with the boom of the crane lying on the opposite side of the train! As we "go to press," there are no reported fatalities, with 20 passengers hospitalized. And despite the fact they were stranded miles from anywhere, plenty of help was soon on hand as the surrounding communities responded. Railroad Stuff: Amtrak 174, Model P42DC, "GE Genesis Series 1," 4,250 hp. Hotel Power: 1 - GTA33 alternator, 800 kW, 480 V, 3 phase, 60 Hz, microcomputer control. Serial Number: 53031. A special "Thanks" to Bill Coe for granting "Oil-Electric" permission to use his photo of the Zephyr on her side. Bill is a professional photographer, and has an excellent web site, which I encourage you to view. 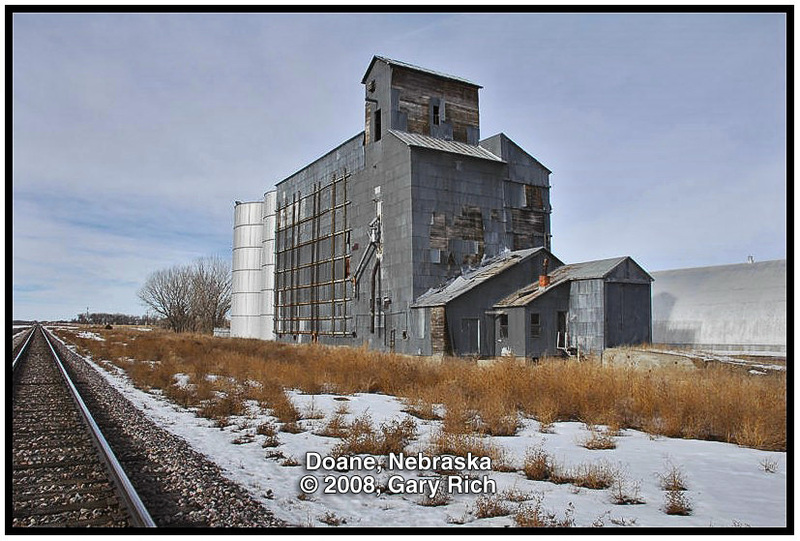 Also to Gary Rich of Aurora, Colorado, for permitting us to use a photo of the Doane silo being demolished. 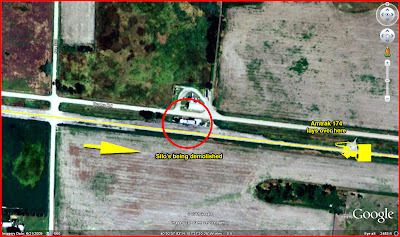 You can see the BNSF main in the photo. Gary has some interesting shots on his site, which I encourage you to take a look at. So, the other day, I was talking with a buddy of mine. 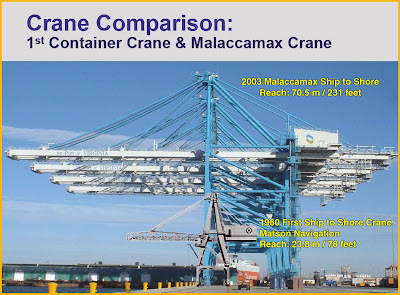 I asked him if had read about the Port of Seattle taking delivery next January of three "long reach" ship-to-shore cranes, for loading and unloading post-Panamax container ships. His reaction: A blank stare. 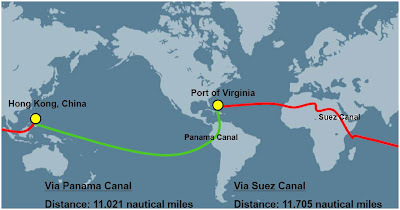 My friend was totally unaware of the gargantuan Panama Canal Expansion Program that commenced back on September 3rd, 2007, and its impact on world shipping. 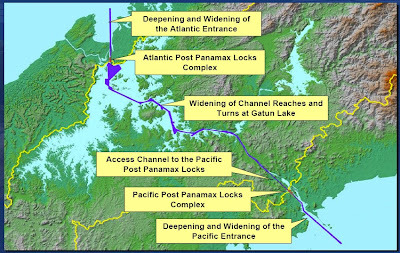 When the Autoridad del Canal de Panamá (ACP) - the Panama Canal Authority took control of the Canal from the United States on December 31st, 1999, there were growing concerns that the existing canal could reach capacity by the second decade of the 21st century. 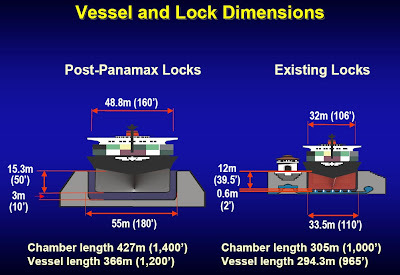 Indeed, the existing locks prevent passage by vessels measuring more than 106 feet wide (beam.) 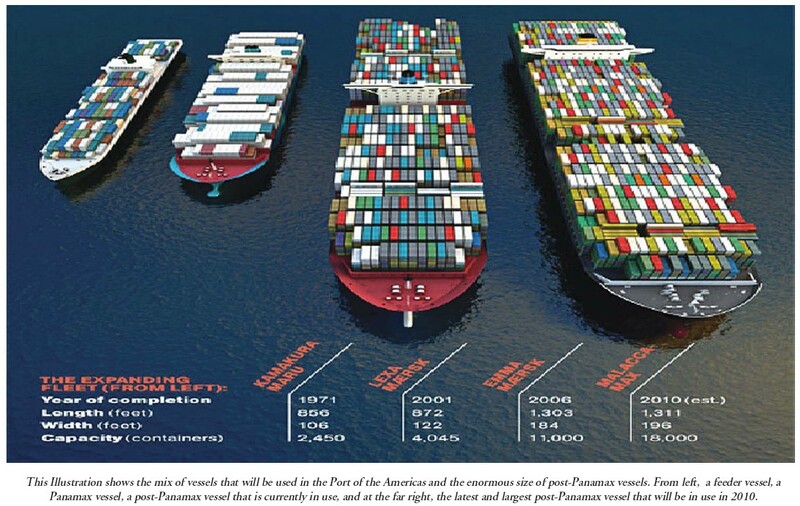 But the economic reality of international trade have resulted in ships being built much wider. But more pressing is the existing backup of vessels waiting to use the Canal! 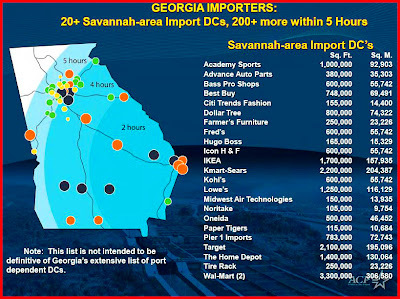 Two days waiting in the Roads are two days of overhead expenses, amounting to thousands of dollars per day, that shipping companies and customers can ill afford! 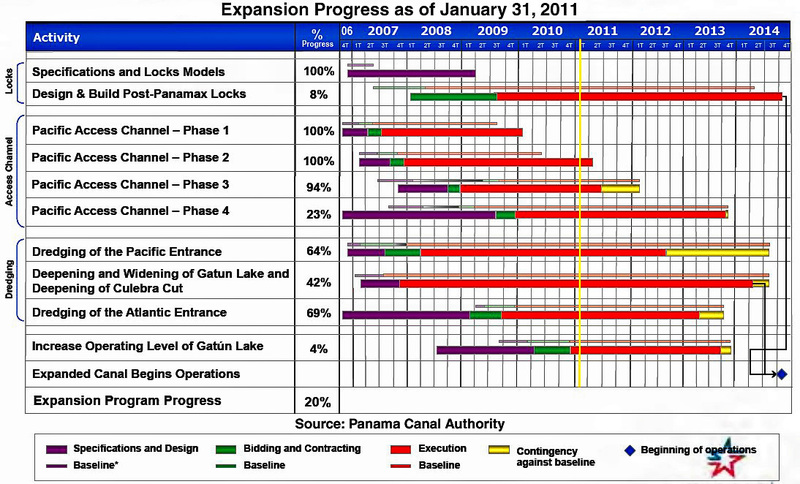 Panamanian President Torrijos and his Cabinet approved the expansion project in June 2006. The Legislative Assembly overwhelmingly approved it in July 2006, with 72 out of 78 deputies approving the expansion. The project was submitted to a national referendum, held in October 2006, approved by 78% of voters. 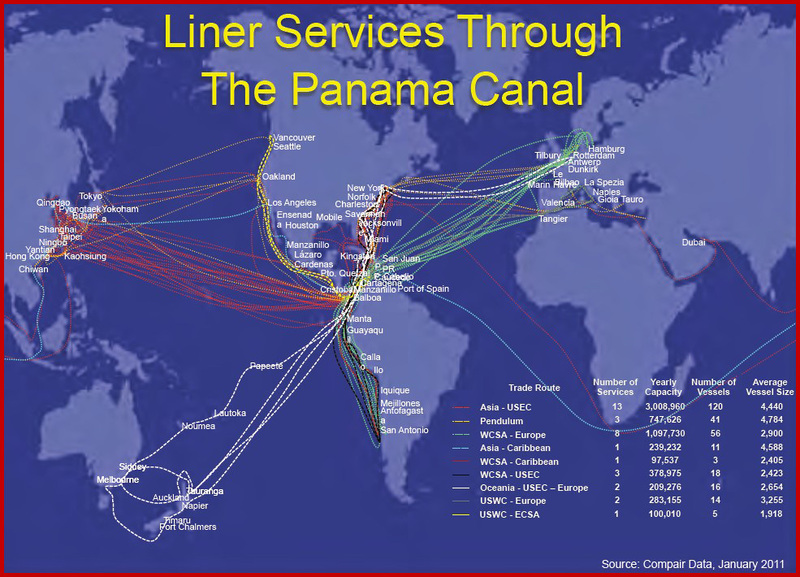 The Panamanian government officially launched the project on September 3, 2007, with a ceremony led by former President Jimmy Carter, whose Administration negotiated the Panama Canal Treaties. 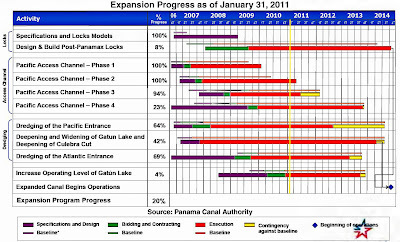 Following an aggressive timeline, the 5.5B (USD) expansion is slated to open in 2014, coinciding with the 100th anniversary of the original canal opening. 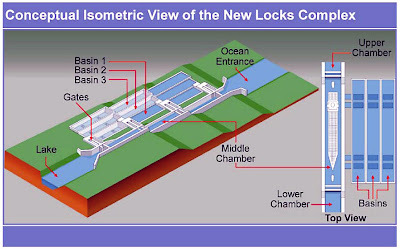 Construction of new locks at the Atlantic and Pacific gateways. 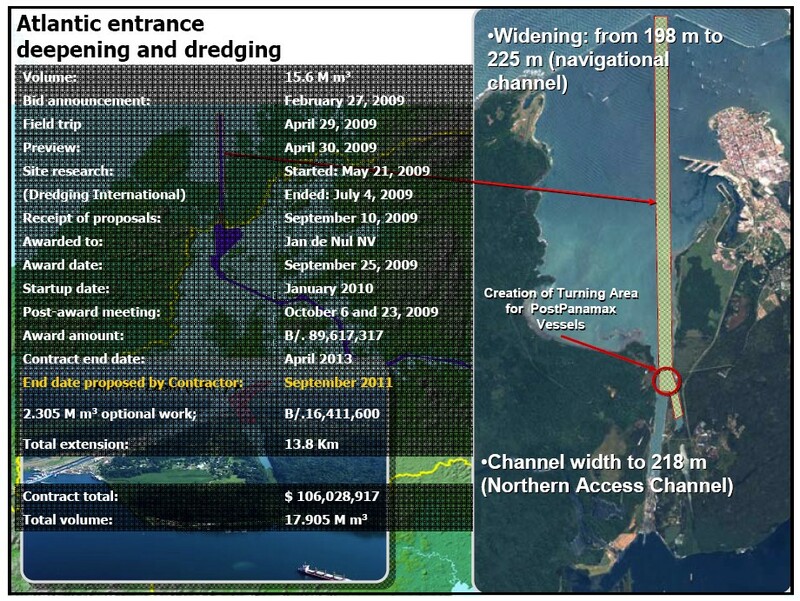 Excavation of new access channels and the widening of the existing channels. 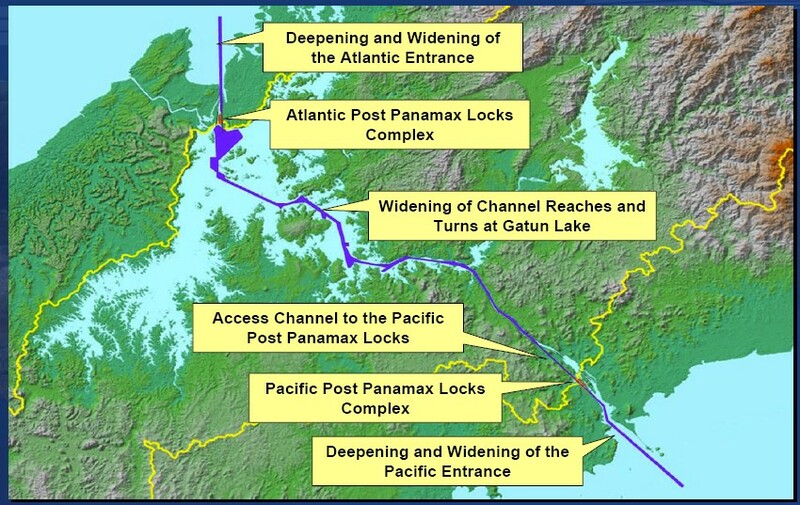 Deepening of the navigation channels in the Gaillard Cut and Gatún Lake. Raising Gatún Lake's maximum operating level. 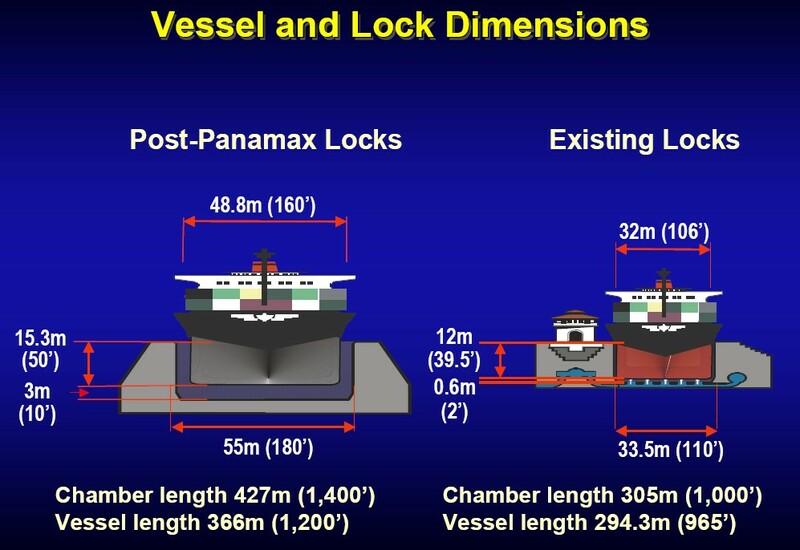 Tugboats to power vessels through locks instead of electric locomotives. Horizontal transverse gates instead of Miter Gates. "Water saver" recycling system will save 7% of Gatún Lake resources. Each vessel will transit with two tug boats, front for advancement, rear for braking, thus, eliminating the famous electric "mule" locomotives, along with their tracks and line handling personnel. Horizontal transverse gates, rather than "traditional" Miter Gates. Miter Gates required a massive floating crane to lift and replace worn or damaged gates. Not only is a lane shut down to switch out gates, the process is time consuming and delicate, requiring divers to align the miters. Beginning Wednesday, August 10, 2011 at 2000 hours through Thursday, August 11, 2011 at 2200 hours, and beginning Wednesday, August 17, 2011 at 2000 hours through Thursday, August 18, 2011 at 2200 hours, the East lane at Gatun Locks will be out of service. These two 26-hour outages are necessary for the removal and reinstallation of Miter Gates, and other scheduled maintenance work. 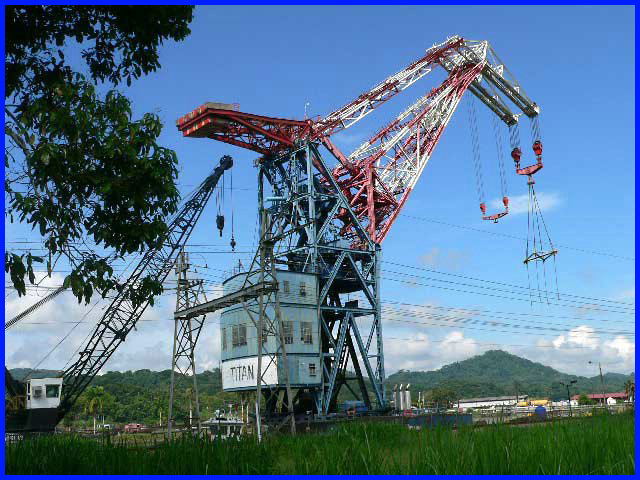 Among the largest floating cranes in the world, "Titan" was one of three massive floating cranes ordered built by Adolph Hitler. One was claimed by the United States as war booty. 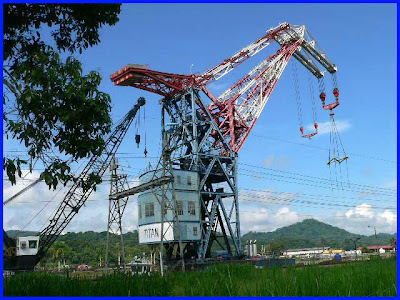 Named the "Titan," it can lift 350 metric tons and at the time, was one of the strongest cranes in the world. "Titan" entered service in Panama in 1999, after having served for 50 years in Long Beach, California. The crane can be floated into the locks and is used for the heavy lifting required to maintain the miter gates. Of the other two floating cranes, the British got one, but lost it in a storm while towing it home across the English Channel. The Russians got the third, but no one seems to know what became of it. "Water saver" recycling system. Rather than loose precious water on each lock cycle to the open sea, the displaced water is fed into ponds. Notice their action in the video. 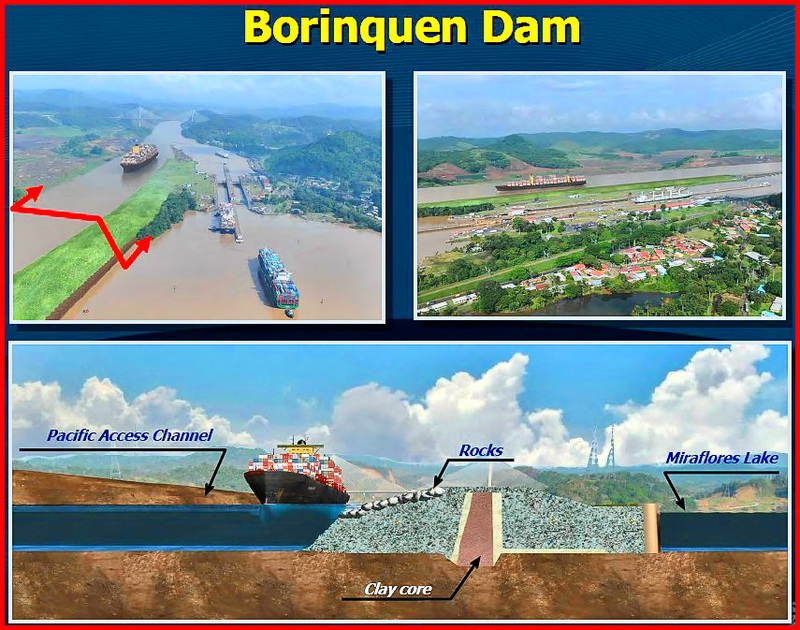 While the scope of the Expansion Program is impressive in terms of material that needs to be removed, the most daunting and critical construction feature of the Canal Expansion is the so-called "Borinquen Dam." 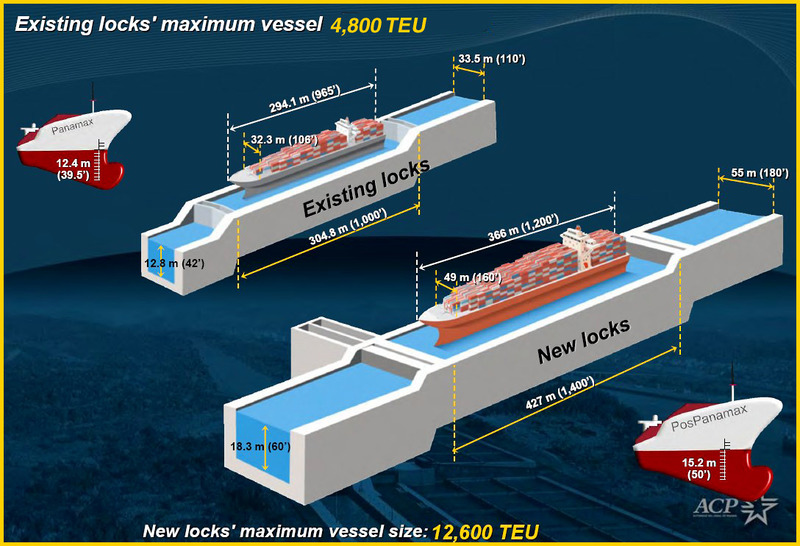 The new Pacific Locks incorporate the combined lift now accomplished by the Miraflores Locks, and nearby Pedro Miguel Locks. About a mile separates the current locks, across Miraflores Lake. Since the new traffic lane is 32 feet above Miraflores Locks and Lake, a series of Borinquen Dams, sheet steel cofferdams, are being constructed along "Borinquen Road." These structures will contain the pressure of water exerted by the third traffic lane, which travels 32 feet above the existing Pedro Miguel Lock and Miraflores Lake, by-passing both the San Miguel and Miraflores Locks! A massive effort at the Atlantic end of the canal, with dredging and a new set of locks under construction. The Panama Canal Authority has been kind enough to share some of the construction activity, for us "sidewalk superintendents," via web cam video. My favorites are the two Panorama View cameras, one at the Atlantic, the other at the Pacific, where you can view the new locks as they are being constructed 24/7. 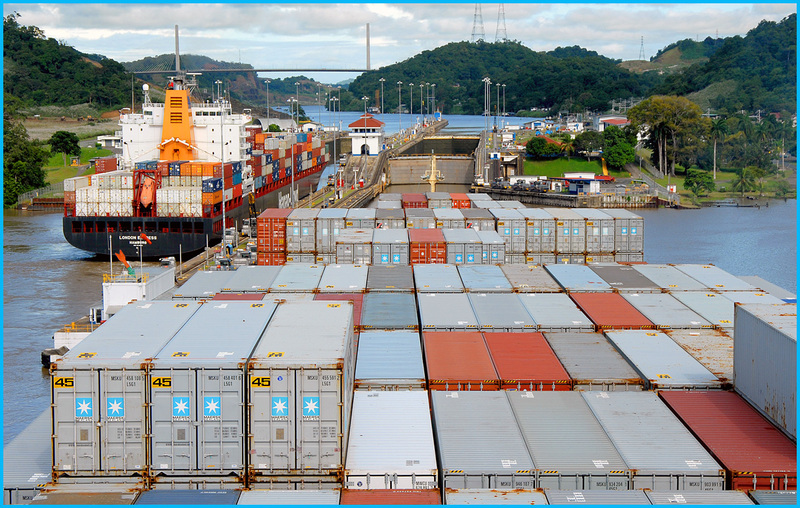 The impact of the Panama Canal Expansion on the shipping world has been compared to the invention of the shipping container. On 26 April 1956, Malcolm McLean’s converted Second World War tanker, Ideal X, made its maiden journey from Port Newark to Houston. 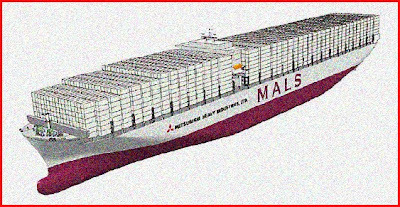 It had a reinforced deck carrying 58 38-foot metal container boxes as well as 15,000 tons of bulk petroleum. 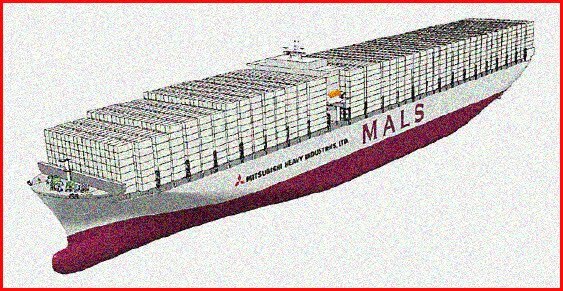 McLean's enterprise became known as Sea-Land Service, now Maersk-SeaLand. Container ports compete on a number of levels, not the least of which is "containers per hour per porch." That is, how many containers can be lifted off the vessel and placed on the bomb-cart - skeleton trailer and returned to the vessel. 54 containers per hour is not uncommon! 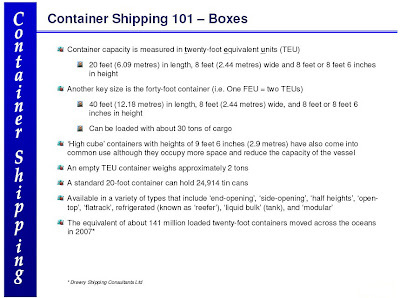 Shipping container size was finally standardized for intermodal international transportation. 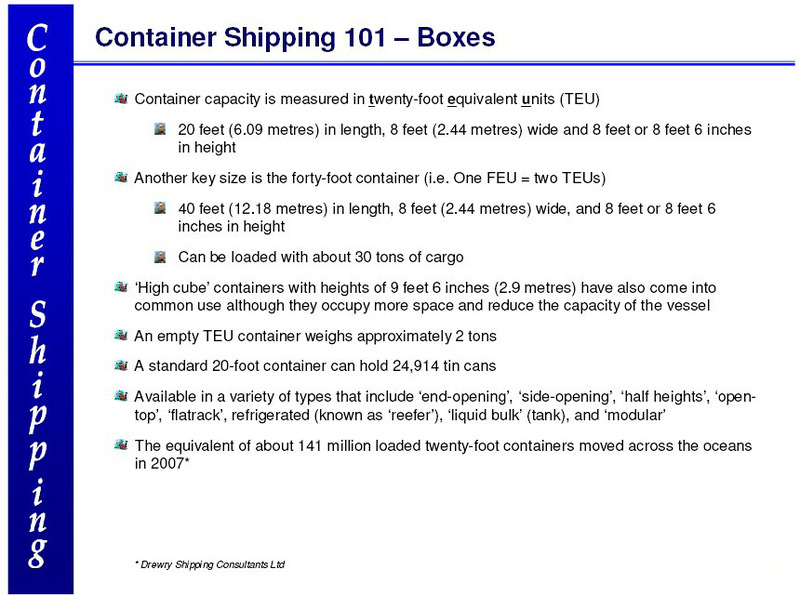 Container ships are rated by the number of 20' shipping containers they are capable of carrying. 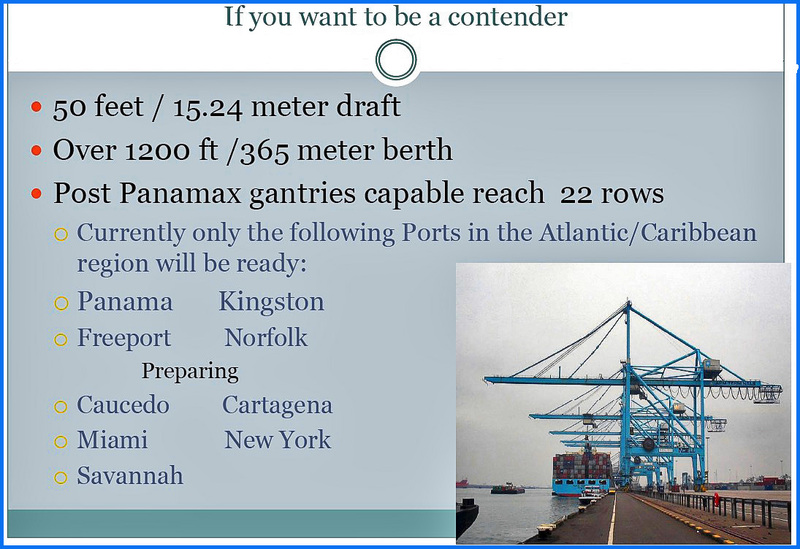 Virtually every port on the East and West Coasts of the United States and Canada, are scrambling to understand the impact of post Panamax expansion container ships. 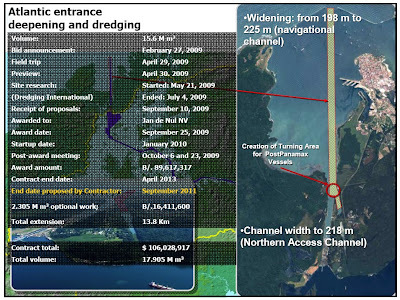 Some ports are undertaking massive dredging projects, others evaluating ship-to-shore cranes and terminal yards. 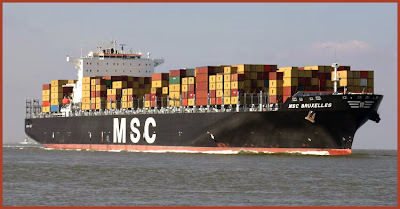 Currently, containers using the ship / rail connection to the east coast take approximately 20 days. The new generation of ships will simply transit the canal, taking approximately 25 days. So as you can imagine, spreadsheet analysis are certainly being conducted. 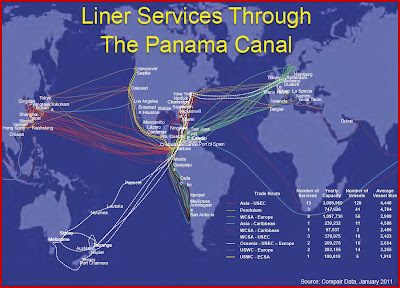 And yet to be determined, the impact of the New Canal on rail traffic. 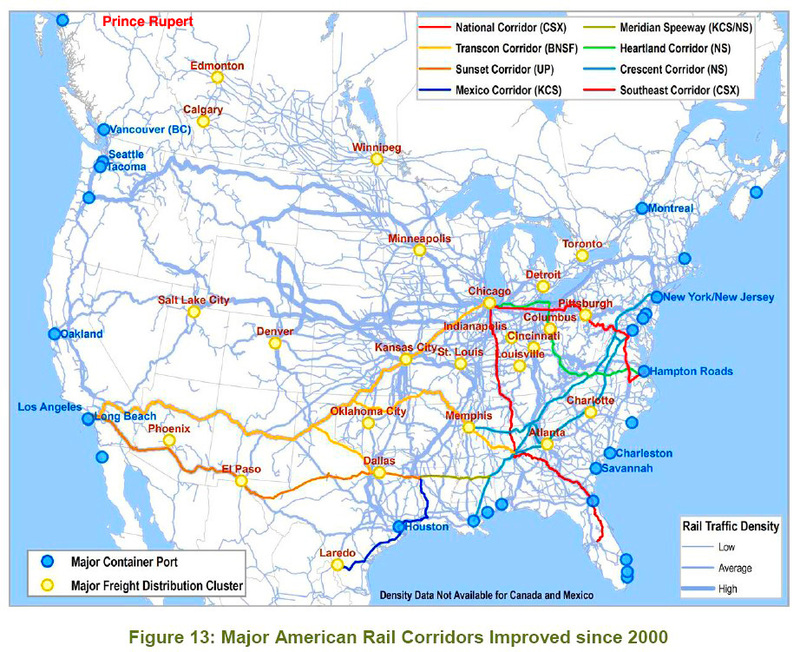 Burlington Northern Santa Fe and Union Pacific in particular will be analyzing the effect of ships by-passing the West Coast all together. 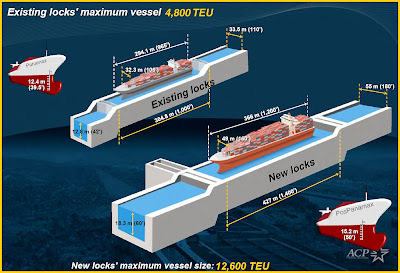 For now, it seems to be a given that time sensitive cargoes will continue to use the sea / rail connection, whilst general cargoes will simply be transshipped through the new Canal. 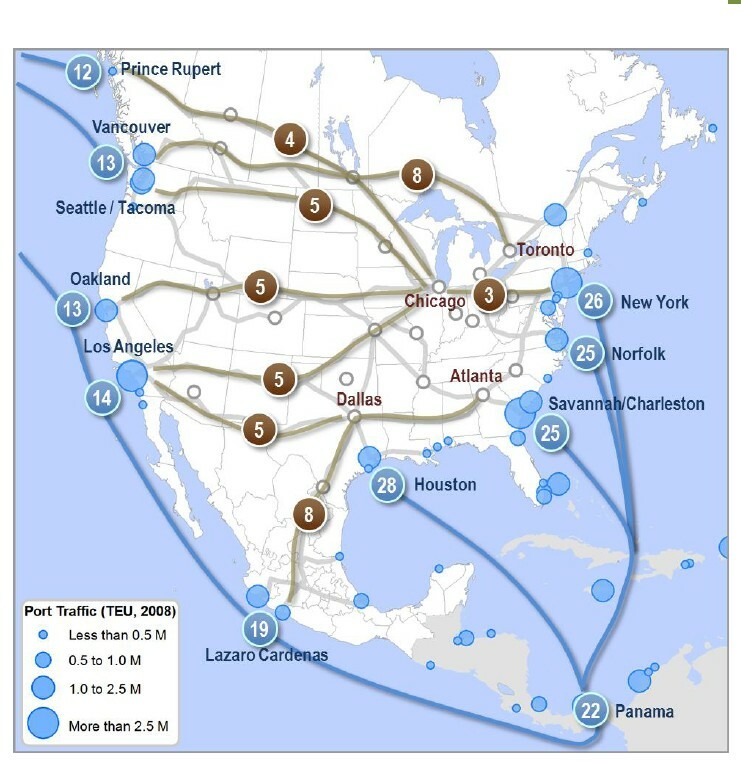 Not so certain is the effect to be felt by the Ports of Seattle/Tacoma, and Vancouver, B.C. And already, the general weakened economy has put the second phase of construction on an indefinite hold in Prince Rupert. 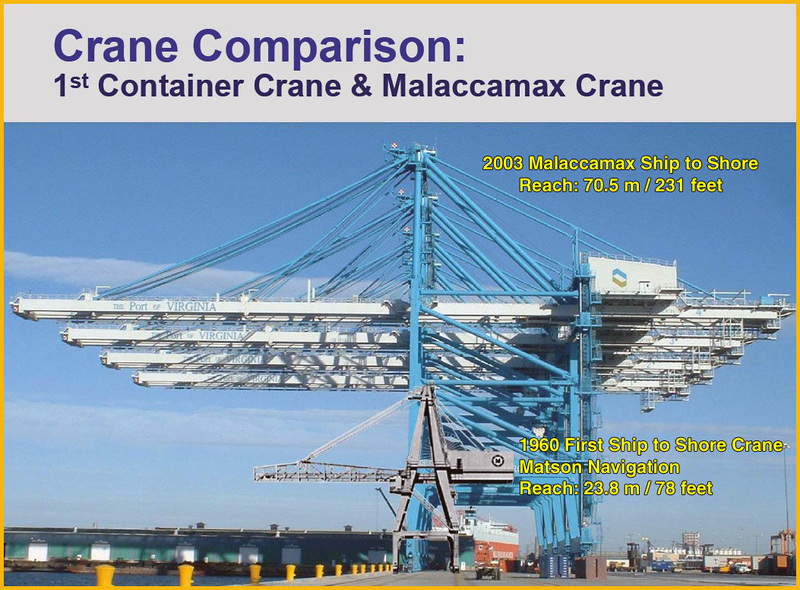 On the "plus" side, Prince Rupert did install "long reach" ship-to-shore container cranes. 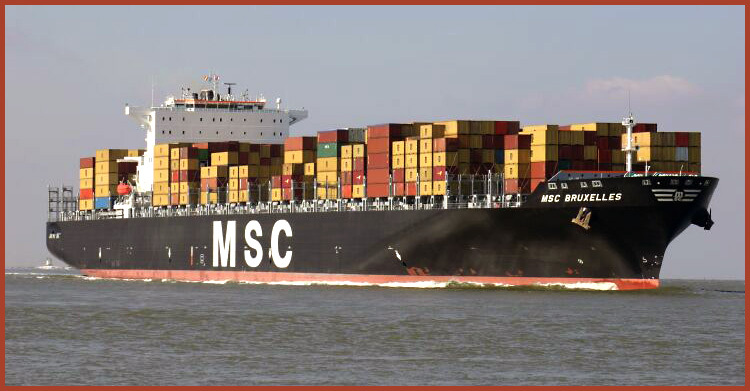 In July 2011, Mediterranean Shipping Company (MSC) sent her 9,200-TEU container ship "Bruxelles" to five major east coast ports, to get a "feel" for channel depths and determine lane improvements that will be necessary to handle the post Panamax container ships. 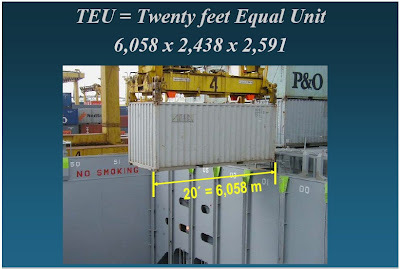 This ship is drawing 49 feet of water, and is 160' wide (beam) - like a five story building under water - in channels and alongside container piers! 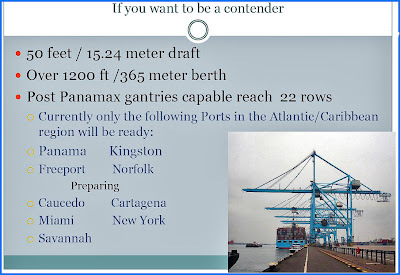 Details of how selected ports are responding to the "Post Panamax Effect" and a primer on current US/Panamanian Relations are found in the Suggested Reading following this article. Not only are US and Canadian Ports impacted, but also feeder lines to Central and South America. To ignore the possibility of a competitive response recall the fate of the Groupe Eurotunnel SA that went bankrupt as ferry operators improved their service and reduced their costs in response to the competitive threat of the English Channel "Chunnel." 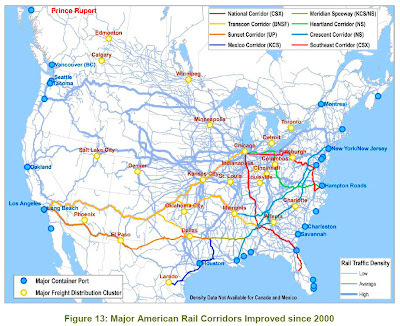 The Canal Expansion has certainly heated up the competition of east coast ports. 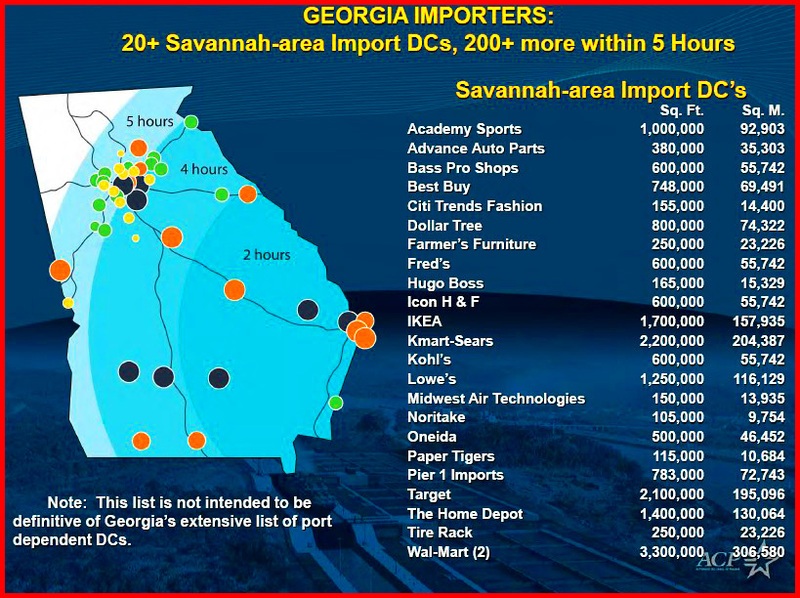 Here, for example, is how the Canal Expansion could affect the Port of Savannah Georgia. Who the heck is Grover Norquist? 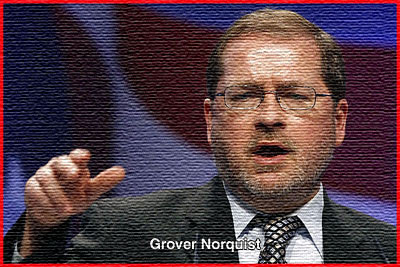 Have you noticed that in many news stories involving taxes, the name "Grover Norquist" keeps popping up? I did. And I got to wondering what was all this nonsense about the "Grover Norquist Pledge." Here's what I found out. Back in 1985, at President Ronald Reagan's request (that alone tells you this story isn't going to have an happy ending,) a tax advocacy group was formed "Americans for Tax Reform." Apparently, it had not gone unnoticed that many politicians got into office by swearing on the bible of their dead mother, that if they got elected, they would not raise taxes. Of course, the reality being, once they arrived on the shores of the Potomac, it rapidly became clear that if to implement a new plan, or improve an existing plan, chances were that taxes would have to be raised or created. 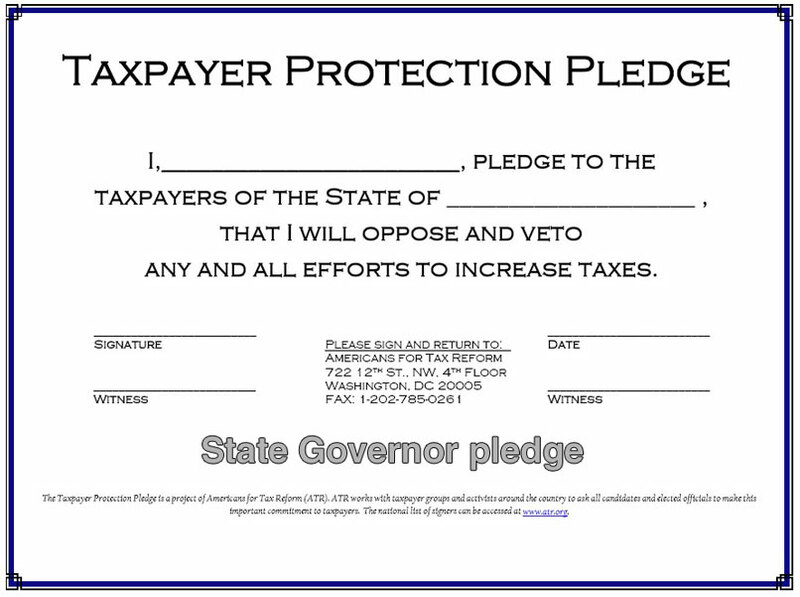 So Grover Norquist contrived the "Taxpayer Protection Pledge" to force politicians to actually sign a pledge, that they would not raise taxes under any circumstances. Have you seen the pledge? Here it is. 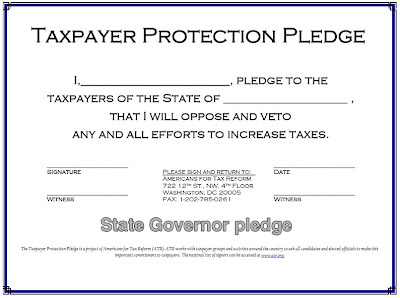 I would think a politician would feel just a little embarrassed at signing this "pledge." How sophomoric. I found the Captain Midnight Decoder Ring pledge to be more "impressive." At least it stressed Honesty, Character, and to drink my Ovaltine! While the premise may be admirable, any sensible person knows, that to sign such a document flies in the face of good old-fashioned common sense. First of all, we all know that user fees, licenses, and taxes are the only mechanism to raise money to pay for services rendered, from your local constabulary, to the Federal Army, and everything in between. Any politician, who signs a pledge not to raise taxes, inhibits their ability to adapt or respond to changing circumstances and conditions. 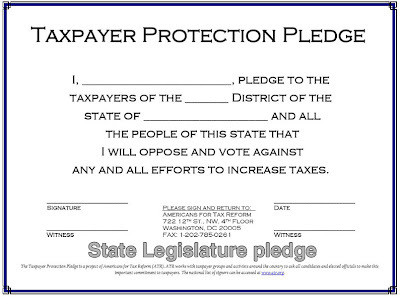 Any elected official who signs such a pledge has no business holding public office. Because, they have pledged away the ability to administer to the needs of a responsive government. Let's take as an example, funding the two money-sucking quagmires; Iraq and Afghanistan. Since many of our politicians have signed the "American's for Tax Payer Reform Pledge," they are in a quandary as to how to continue two undeclared wars, without raising taxes. Had we taken a logical pathway into Iraq and Afghanistan, we would have had hearings and yadda yadda, and then closed with a discussion of how to FUND the military excursion. But we all know how it went down, and now 10 years - 10 years later, still pumping money into it with absolutely no end in sight. First. If they have run out of money and cannot raise taxes to continue playing Rambo in some god forsaken litter box, then pack up the troops and bring them home. Obviously that isn't an option. "Hey, Senior Citizen, you don't need that much to live on, giime some of your money." "We don't need clean air, shut the EPA down." "We are so far behind the eight ball in education, cut educational spending." "Let private insurance companies run the meds - we need the money!" Third choice. Apply common sense that dictates you have to "raise taxes" to pay for new or increased spending. What the heck is difficult to understand about that? 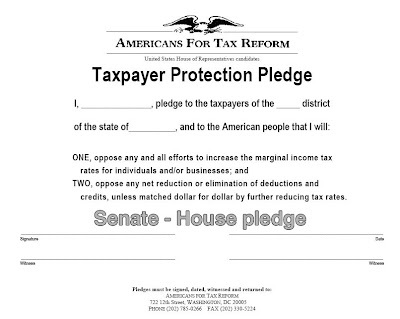 But, for some reason beyond my comprehension, that "pledge" they signed for some anti-tax group, keeps them from doing what they know in their heart of heart is the correct thing to do, raise taxes. And make corporations pay taxes. 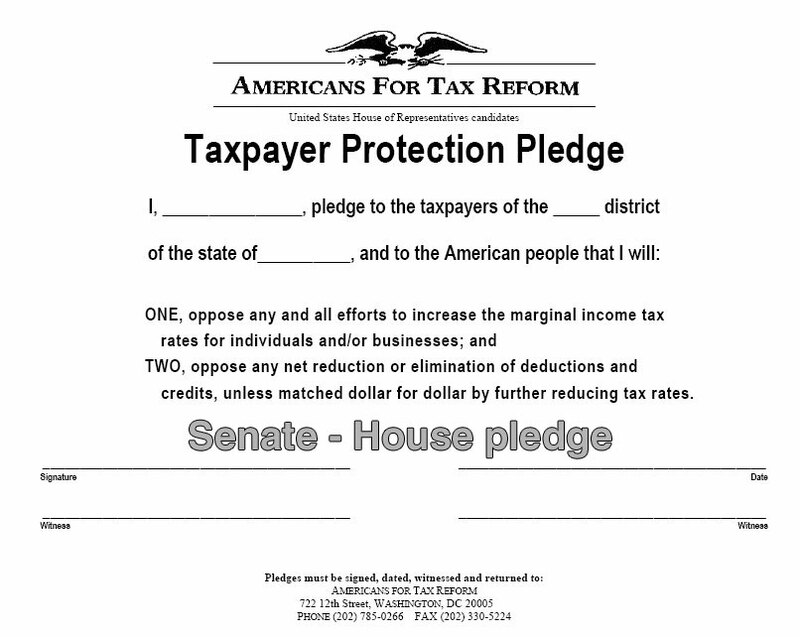 I've read all the gobbledy-gook on the Americans for Tax Reform web site, and I find nothing that states, "If you break this pledge, you will be _______________!" So how does one dude wield so much power? There are no exceptions to the Pledge. Tax-and-spend politicians often use "emergencies" to justify increasing taxes. In the unfortunate event of a real crisis or natural disaster, legislators should cut spending in other areas instead of aggravating the situation. In the face of natural disasters, governors like Haley Barbour or Jeb Bush have demonstrated such fiscal leadership and have worked through the problems without raising taxes. I am angry. I don't recall seeing the name "Grover Norquist" on any ballot, state or national that I have fulfilled. Have you? And while he is certainly entitled to rant and rave about raising taxes - more power to him - he must do so in the same manner any of the rest of us do, through making our feelings known to our elected representatives, through letters, emails, phone calls and the ballot card. But, he does not have the right to hijack my elected politicians, and hold them hostage to his beliefs. Not my beliefs - his beliefs. He does not have the right to get his own way, by disenfranchising me. 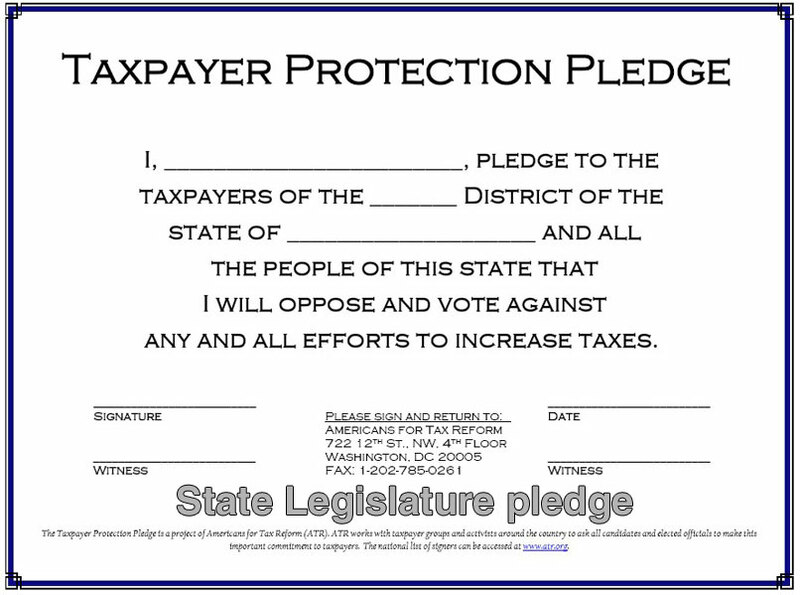 And if one of my elected officials believes he/she should sign the Grover Norquist Pledge, do so BEFORE I am asked for your vote! And make it abundantly clear to everyone that you have signed the pledge! Not get elected and THEN sign the pledge. That is abhorrent beyond belief. If you have no problem with them taking the pledge, you are good to go! On the other hand, if you do not want Grover Norquist representing you, use your vote at the ballot box, to rectify any discrepancies. From what I've been told, in the moments following an accident, there is a momentary lull. The brain struggles to comprehend what has just occurred. Then the response begins. In the case of this train wreck, miles from nearest first responders, passengers relied on each other to get off the train and endeavor to render comfort and aid to the injured. There was a fellow who jumped right in to help rescue victims and help the injured. While carrying a woman to an ambulance, he injured his leg. He never told anyone what he had done, and how his leg got injured. His brother asked him weeks later why he was limping. Finally, he told his brother about the wreck. "You don't know how bad it was there. He'd never seen such disruption and injuries. And he said I never hope to see it again in my life." The pain in his leg continued. Unable to work and laid off, he sought help Winnemucca. He was treated for a blood clot in his leg. But the pain continued, so he went to the VA hospital in Reno. While undergoing treatment Wednesday, the blood clot ended up in his lungs and he died. His death leaves a wife and a lot of medical bills, but little else. He had no insurance. His brother Al Breen says, they aren't asking for help. But they do want something his brother never sought, for others to know what he did that day. You see, Bob Breen was also an employee of John Davis Trucking Company. On June 24, he was a few minutes behind his buddy traveling westbound on US 95. He was first on the scene, and recognized the wrecked trailers to be that of his buddy. It was Bob Breen who injured his leg while carrying a woman to a waiting ambulance. 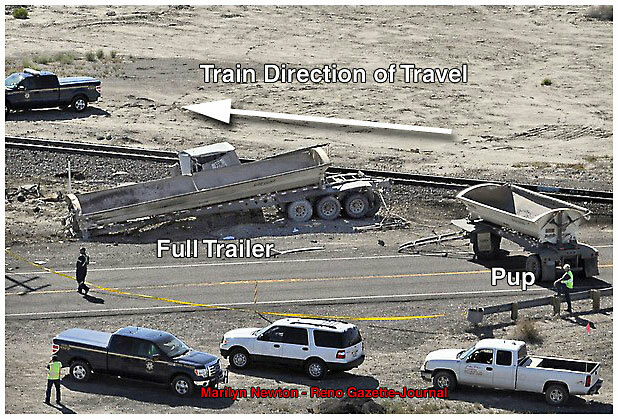 The National Transportation Safety Board has just released a "preliminary" report concerning the deadly rail accident in the Forty Mile Desert near Miriam, Nevada, back in late June. As you recall, a tractor pulling a full trailer plus a pup, skidded more than 300 feet into the side of the westbound Amtrak California Zephyr. The Zephyr was running on Union Pacific steel, enroute to the Bay Area from Chicago. 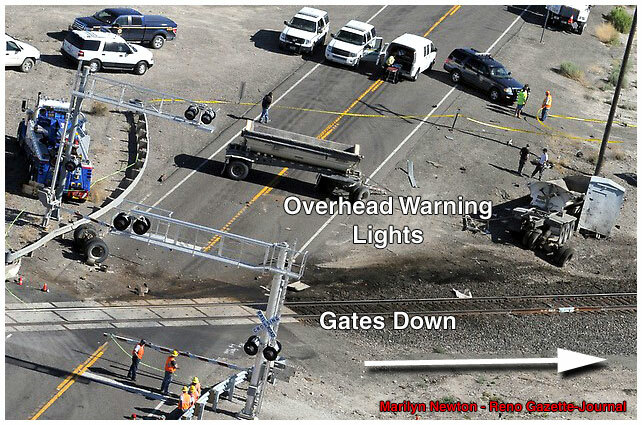 "A color video recording from the lead locomotive showed that the crossing gates were down as the train approached the crossing and the audio recording confirmed that the train horn and crossing bell were activated." Seven lawsuits have been filed as a result of the crash. Sardonically, a counter-suit was filed against Amtrak and Union Pacific by John Davis Trucking Co last week stating the railroad companies "inadequately warned drivers crossing the tracks." Where the heck is Vadinar? 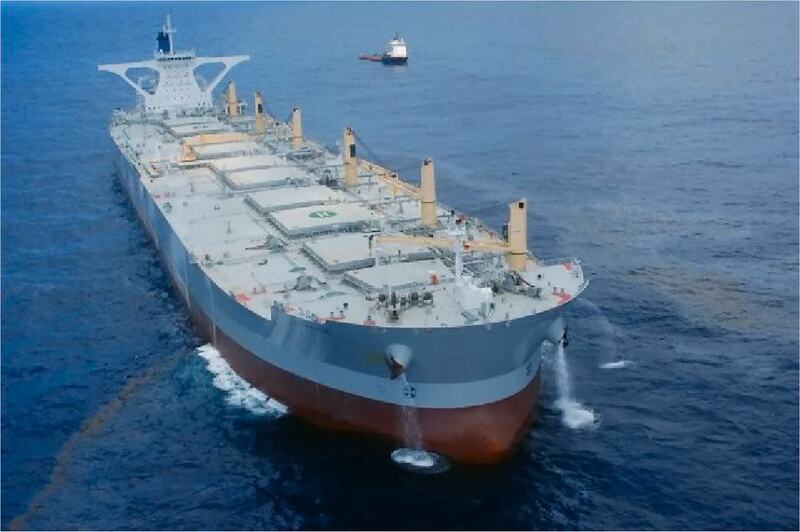 About this time last year, the "A Whale," a brand spanking new tanker, hastily modified to become a "super oil skimmer", had totally captivated me. With a great deal of media fan fare, the "A Whale," found itself steaming in test patterns on the Gulf of Mexico, attempting to siphon oil gushing from the Deepwater Horizon disaster. Following her humiliating performance, she dropped off the front page and slipped quietly out of town. But I followed the "A Whale." And am I glad I did! She led us to Brazil to load her first revenue cargo of iron ore. That resulted in a four-part article on one of Brazil's premier Heavy Haul Corridor iron ore carriers, the Estrada de Ferro Carajas Railroad. To this day, those four articles are still in the top five "What folks are reading" on this Blog, with more than 5,600 individual reads! On this "anniversary," I was curious as to where she was a year after the fiasco on the Gulf of Mexico. 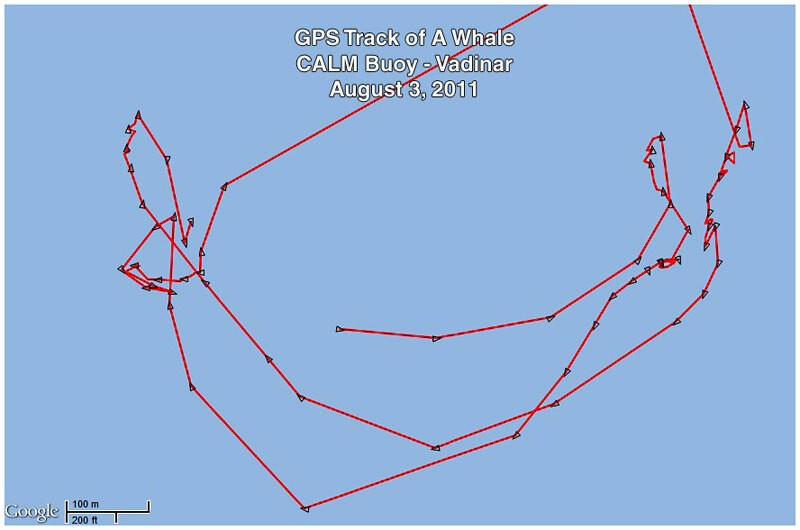 So I retrieved the Global Positioning System records for the "A Whale." This is what I found. 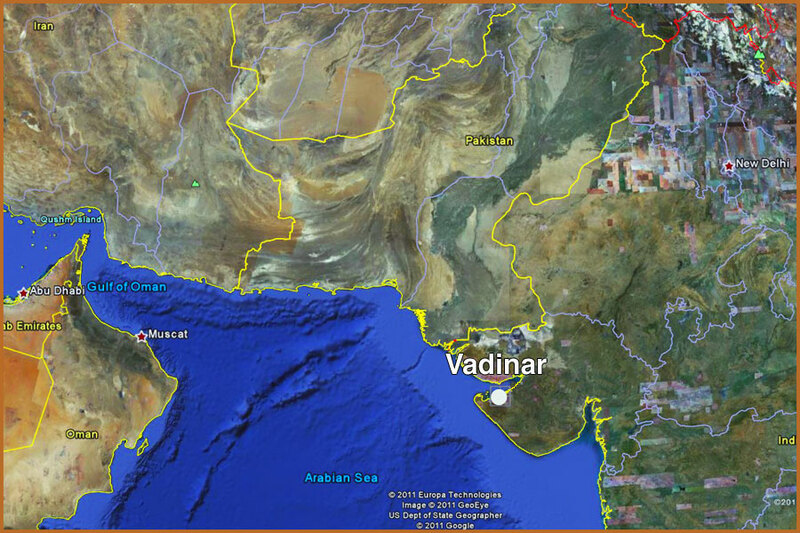 The "A Whale" had been dispatched to Vadinar, India. You may recall the "A Whale" is a special breed of vessel, designed in such a way that her tanks allow her to carry iron ore pellets, or crude oil. Hence her designation as a VLOO - Very Large Oil Ore carrier. So, "Where the heck is Vadinar?" Vadinar is the location of Essar Oil Refinery Limited, the second largest oil refinery in India, located adjacent to the largest oil refinery in the world, Reliance Petroleum Limited. Vadinar was a sleepy fishing village located on the Gulf Of Kachchh. 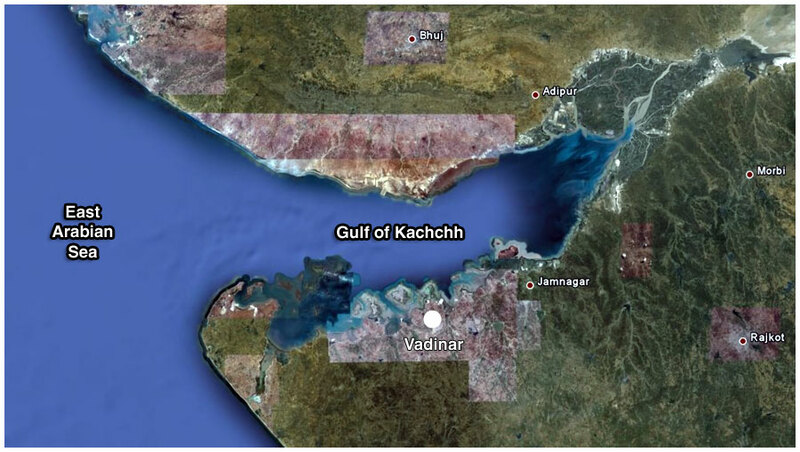 The Gulf of Kachchh, reaches eastward from the East Arabian Sea, some 110 miles (180 km.) The gulf varies in width from 10 to 40 miles (16 to 65 km). It is rimmed with mudflats. And many small islands arise from its waters. This small village came into international maritime maps after the country's first single point mooring system was installed in 1978. 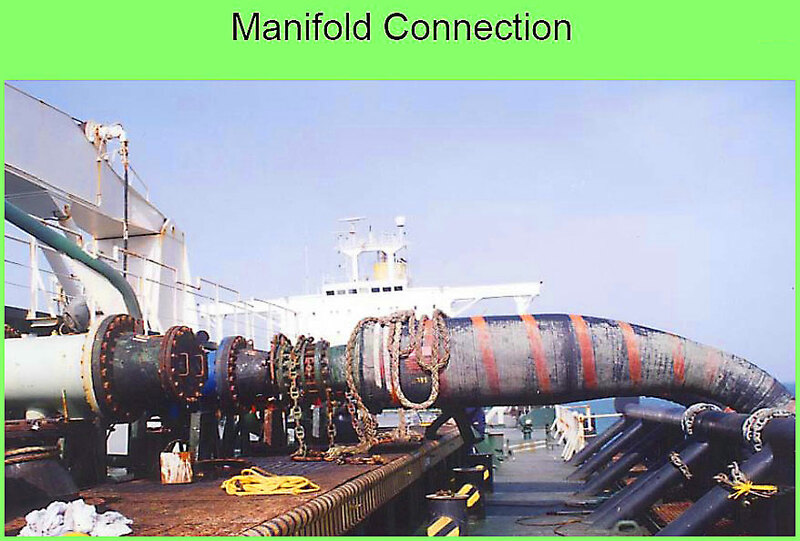 The unloading buoy is the terminus for the 1,870-kilometer (1,161 mile) Salaya-Mathura pipeline. The Essar Petroleum complex, started in 1996 but wracked by problems, was finally completed and "on line" May 1st, 2008. In 2010, Essar refinery produced 14 mmtpa (million metric tons per anum), or 300,000 barrels per day of diesel, petrol, jet fuel, kerosene, fuel oil and bitumen. 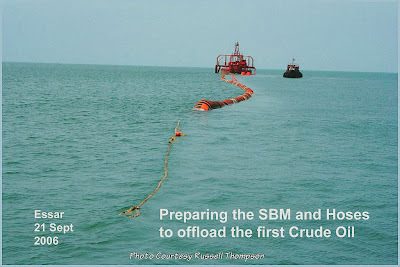 In the United States and other countries, refinery output is measured in bbl's - barrels per day. India and many European countries measure their output in mmtpa - million metric tons per anum. The loose but simple rule of thumb for conversion is that a barrel a day is roughly 50 tonnes a year. The Essar refinery in Vadinar has the tallest distillation tower in Asia, 97 meters (318 feet). The Vadinar refinery has successfully processed more than 32 varieties of crude from across world, including some of the "toughest crude's." Essar will expand the refinery capacity threefold over the next few years, placing it among the five largest single-location refineries in the world. 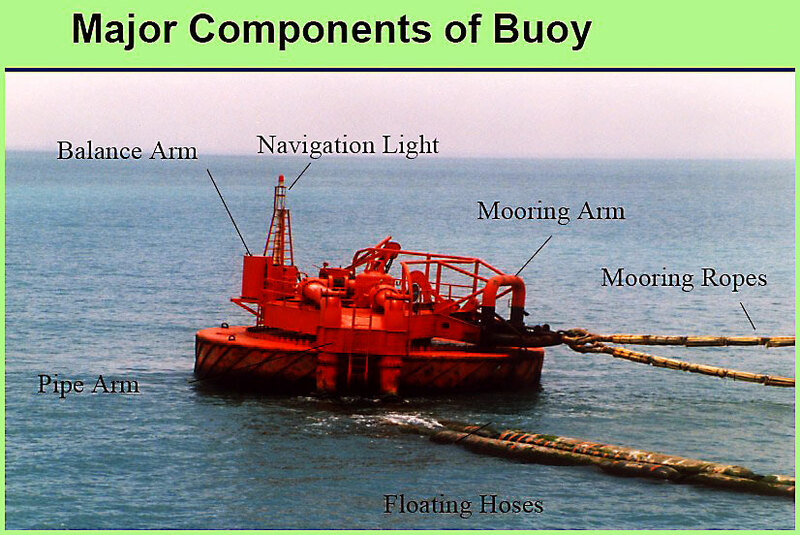 Single Buoy Moorings are commonly used to load and unload tankers drawing too much water to safely enter a port. 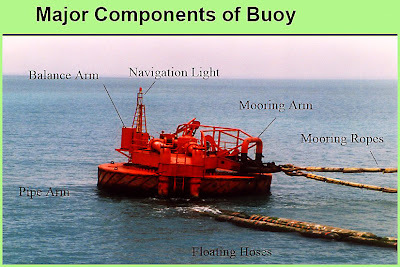 There are several different types of these mooring systems. See "Suggested Reading" below. 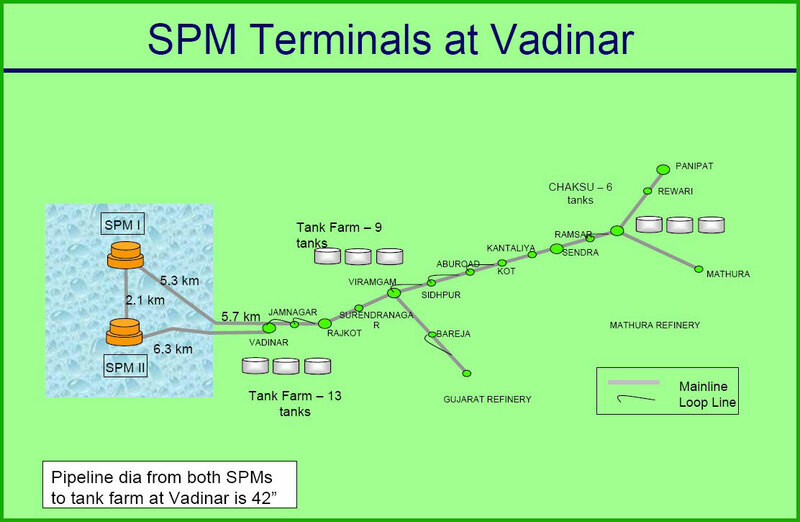 This apparatus at Vadinar is correctly referred to as a CALM mooring, Catenary Anchor Leg Mooring system. 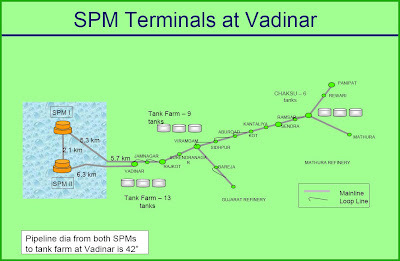 The second mooring point at Vadinar, constructed by Valentine Maritime, Limited, is adjacent to the first SBM installed in 1978. With the assistance of a tug, the tanker is secured to the buoy. 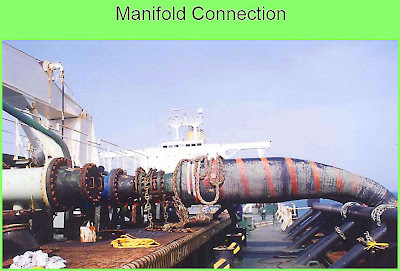 Large diameter rubber hoses with mating plates are hoisted aboard the tanker and connected to the tankers main manifold. Wind and tide move the assembly around, which accounts for strange GPS signature. So! 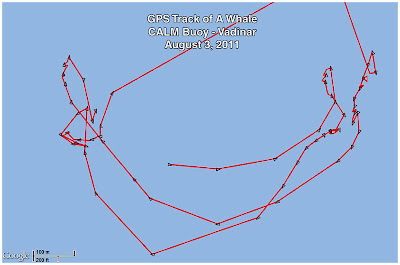 Once again, the "A Whale" has directed us to yet another interesting location!